In Holland there used to be many windmills. They were used to pump the water from the polders, grind flour, saw wood, etc. Only few of them remain now, but the name Moolenaar can be found all around the world. If your last name is Moolenaar, you can get an entry on these pages by filling out this form. 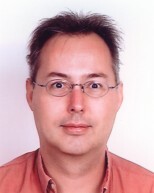 The remainder of this site is for Bram Moolenaar. CAcert I'm a CAcert assurer. CAcert is a Non-Profit Certificate Authority. Photo albums Pictures I took while exploring the world. Documentation can be found on this site, including the language specification and the Zimbu templates specification. A desktop calendar for 2019, made from one sheet of paper. 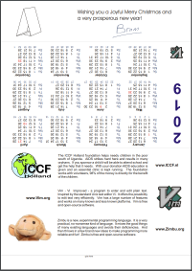 After folding, one side contains a useful 12-month calendar. Vim and Zimbu. All files are PDF format, about 125 Kbyte. I am very proud to get this award for my work on Vim and open source in general. 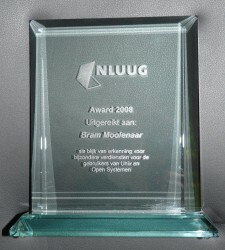 The NLUUG is the Dutch Unix user group, they recently celebrated their 25th birthday. Other people who previously received the award are Guido van Rossum and Piet Beertema. So I'm in good company :-). The award was handed out at the NLUUG spring conference. Gijs Hillenius interviewed me, which resulted in this article in the dutch newspaper AG: 'Weinig aandacht voor open source in Nederland` . Another interview was published in the Czech magazine LinuxEXPRES. Here you can find the original Czech version: Interview screendumps and Interview PDF. Here is an English translation: Interview HTML. The GNU FDL license applies to these texts. There are now about a dozen books about Vim. Many are for beginners, some are for advanced users. Some are a bit old, some are fresh off the press. Most books are in English, but there also is a small book "Vim GE-PACKT" in German. If you search for it, there are translations of some of the books in various languages. You can find more information here: Vim books. Moolenaar.net is supported by Driven Coffee. See their fundraising ideas here. Send comments to webmaster AT moolenaar.net.